After long years of interest, research and development, Helmut Brinkmann constructed the magnetic direct drive turntable »Oasis«. Since this project was well received by music lovers all over the world, we decided to release a second model that features the magnetic direct drive motor and is inspired by the design of our top-of-the-line models »Balance« and »LaGrange«. The picture shows the standard model »Bardo« with the magnetic motor drive. The »Bardo performance« features the metal cased power supply that is used for the »Balance« and »LaGrange« turntables instead of the standard power supply. The result is a more defined bass response and a wider room imaging. 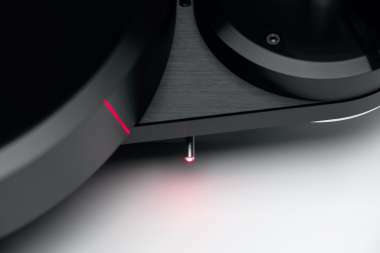 The tonearm base of the »Bardo« can be rotated and fixed without play to allow a simple and precise tonearm adjustment for all tonearms between 9” and 12”. We drill the base according to the tonearm that the customer chooses. 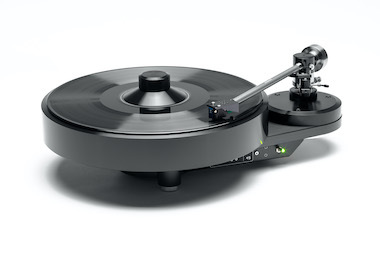 The output sockets can be found on the back of the turntable, they can be equipped with RCA or XLR sockets, and it is also possible to install tonearms with DIN connectors or fixed cables. The two possible speeds, 33 1/3 and 45 rpm, are selectable by a switch at the front of the turntable and can be fine adjusted via two screwdriver holes that are located next to the switch. The »Bardo« has a magnetic direct drive motor that was developed by Helmut Brinkmann and is produced in our factory. There is only one bearing for the motor and the platter, a circular magnet is mounted into the bearing of the platter and is concentrically driven into rotation via coils on the circuit board under the magnet. An electronic circuit drives the coils via two magnetic sensitive resistors that react to the magnetic fields into a highly constant and slow circular movement. Many of the known direct drive turntables were constructed for studios and radio stations where it was necessary to have very quick start-up times of less than a second which was achieved with high torque motors that speed up and stop the motor very rapidly. This caused heavy cogging effects accompanied by high wow & flutter numbers. To avoid this, we worked long on a proprietary motor control that transfers just enough energy to the motor for it to remain at constant speed. The motor’s stator consists of four specially designed field coils, which are mounted concentrically with high precision around the platter bearing. Based on listening sessions we decided to forgo the typical 90-degree mounting angle in favor of a non-standard 22.5-degree roster, which, due to the magnetic fields overlapping, further reduced cogging. The motor’s rotor also acts as the sub-platter and carries a magnetic ring with eight poles on its underside. Inside the motor, the rpm of a speedometer disc is measured and turned into variable voltage that is fed into a control circuit where the rpm is compared to the reference voltage that is adjustable via the trim pots. A separate heater for the bearing, as included with the »Balance« and »LaGrange« bearings, is not necessary. The motor circuit is kept under current all the time, just the speed is switched to zero or 33 resp. 45. In this way, the bearing is kept warm by the quiescent current of the motor drive. For those who are interested, there is more information about the magnetic direct drive motor of our turntables »Oasis« and »Bardo« in a white paper about the »Oasis«.